Keurig coffee technology makes it easy to make several different hot beverages in one cup servings to suit any taste. However, while the Keurig Espresso K Cup﻿﻿s make a delicious cup of strong coffee, true espresso takes a different process. Keurig offered an espresso machine called the Keurig Rivo. Unfortunately, the unit is now discontinued. 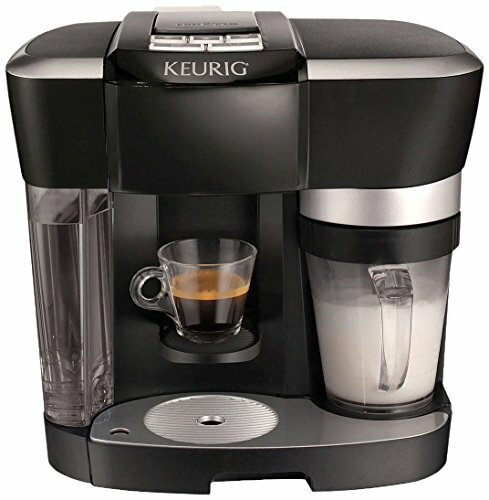 Does Keurig Make Espresso From any Keurig Coffee Maker? Fans of Keurig and the inherent flexibility of this wonderful tool that brews one cup at a time to everyone's individual preference will probably really enjoy the coffee made from the Espresso K Cups. The lack of pressure brewing and crema should never take away anyone's enjoyment of an excellent cup of coffee. The Rivo is easy to load. In fact, in reviewing the manual you'll find that if anything is misaligned, the machine will let you know so you can adjust before you have a terrible mess on your hands. Simply fill the water reservoir, add enough cold milk to get to the minimum fill line, and settle the Espresso K Cup of your choice into the Keurig bin. Whether you prefer a frothy cappuccino, a smooth latte or an iced coffee with cool milk, this tool is easy to use and produces your favorite espresso treat in a matter of minutes. Keurig pods create a lot of plastic waste in landfills. While the Keurig coffee pots offer refillable pods, the Rivo system doesn't yet offer a refillable espresso pod. For fans of espresso who are excited about the Rivo system but not crazy about the waste of the Rivo pods, espresso authorities point out that you can buy replacement foil covers for Rivo pods and refill them yourself. Rivo pods can be purchased in bulk to reduce expense as well. Both of these wonderful beverages are made from ground coffee beans. However, per beverage expert Anna Brones, coffee is made from coarse ground beans, generally brewed with hot water through a filter and collected via gravity in the coffee carafe. Espresso is made with finely ground coffee beans and brewed under great pressure. In fact, espresso is under so much pressure that the carbon dioxide trapped in coffee beans by the roasting process can't escape and results in the foam or crema on top of properly brewed espresso. It should be noted that while there are many espresso machines on the market, this tool can be hazardous if you are not cautious. Extremely hot water under a great deal of pressure can result in nasty burns, and the steam vent for frothing milk should be used with great care. Once you get the hang of it, this process may become second nature, but beginners should study their manuals and proceed with caution.